John Slaughter (left) and Nancy Slaughter carry their tree back to their car after cutting it down at Fisher Christmas Tree Farm in Belfast, Dec. 22, 2016. Christmas trees are often at the center of holiday memories: the fresh tree smell permeating the air, ornaments glinting from evergreen branches, piles of presents nestled snugly under their needled boughs. But will those boughs be real or fake? A 2017 survey conducted by information and research company Nielsen and the American Christmas Tree Association, a trade group that represents the artificial Christmas tree industry, showed that 81 percent of American households that have a Christmas tree will use an artificial tree. The National Christmas Tree Association, a trade group that represents the natural Christmas tree industry, estimates that the number of households with artificial Christmas trees is closer to 75 percent based on their annual consumer surveys. According to a 2014 analysis of industry and company data conducted by Treetopia, an artificial Christmas tree company based in South San Francisco, California, Mainers spent an above-average amount of state GDP on artificial Christmas trees when compared to other states. But in Maine, data shows that real tree farms are doing fine. 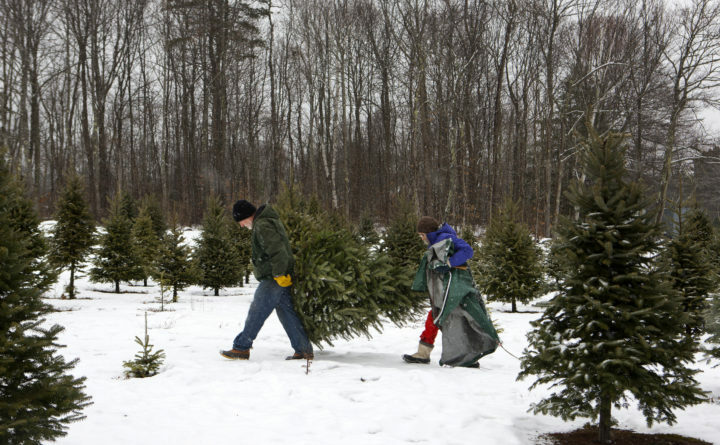 The USDA Census of Agriculture estimated there were about 387 Christmas tree farms in Maine totaling 5,694 acres in 2012, up from 307 farms totaling 4,349 acres in 2007. “We’re all healthy,” Joanne Bond, executive secretary of the Maine Christmas Tree Association, said. “No one’s complaining about not selling enough trees.” Bond, who also owns Bond Mountain Acres Christmas Tree Farm in West Newfield, said that while reports of supply shortages earlier in the season were largely inaccurate, some Maine sellers have already closed for the season because they have sold their stock. Jim Corliss, owner of Piper Mountain Christmas Trees in Newburgh and former president of the National Christmas Tree Association, said the shift toward artificial Christmas trees started in the late 1960s or early 1970s. The first real attempts at addressing the issue of plastic trees, he said, started at the National Christmas Tree Association Biennial Convention in Bangor in the 1980s, where $1 million raised voluntarily from concerned industry members resulted in an unsuccessful series of television advertisements. Over the next few decades, Corliss worked with other industry professionals to make sure their next attempt at bringing the plight of Christmas tree farms to the public was successful. Eventually the USDA’s Christmas Tree Promotion Board, a commodity checkoff program that collects funds from Christmas tree producers to put toward promotion of the product, came to fruition through the 2014 Farm Bill. In 2015, the board launched the “It’s Christmas. Keep It Real.” campaign to promote natural Christmas tree sales around the holiday season, a promotion they’ve continued every holiday season since. This year, according the Christmas Tree Promotion Board’s executive director Marsha Gray, the industry will spend $1 million on ad campaigns that target young millennial families, their “sweet spot” market. Corliss echoed the concerns. “A lot of the closures actually have been more because of age, but the point is nobody opens a new one,” he said. That, plus the rise of artificial trees, does not bode well for the future of the industry in Maine. Artificial tree producers feel fears of the impact of fake trees on the natural Christmas tree industry may be overblown. In pure numbers, there are still more natural Christmas trees sold in the United States every year than artificial trees. In gross numbers, natural Christmas trees still outsell their artificial counterparts. According to data from Nielsen/Harris and the National Christmas Tree Association, Americans bought more than 27 million natural Christmas trees in 2017, compared to about 21 million artificial trees, but annual artificial Christmas tree sales have grown from 9 million to about 21 million between 2004 and 2017 while sales of natural Christmas trees have remained relatively steady over that same period of time. For some households, the switch to an artificial Christmas tree is an economic decision. Nationwide, prices for natural trees have reached record highs around the country due to limited supply. The average price of a natural Christmas tree last year was $75, compared to $107 on average for an artificial tree which, according to Harman, is reused for an average of eight years. But Harman said the biggest draw is convenience. Artificial trees come boxed in easy-to-assemble sections; you do not have to tether it to the top of your car, cut the bottom off, vacuum needles, or conduct any other natural Christmas tree maintenance. With more families keeping their Christmas trees up longer, artificial trees are less of a fire hazard and harbor fewer allergens than the natural counterparts. “Everyone loves decorating the trees, but I still haven’t met anyone who loves putting the lights on,” Harman said. Then there is the issue of sustainability. Though artificial Christmas can be reused, they are largely made in overseas factories from nonrenewable materials like plastic. A study carried out on behalf of the American Christmas Tree Association (the trade group that represents artificial trees, not to be confused with the natural tree advocates at the National Christmas Tree Association) documenting the life-cycle environmental impacts of artificial and natural trees determined that the breakeven point — when the environmental impacts of the artificial tree are less than that of real Christmas trees when looking at the yearly impact of shipping, energy and water use — is around five years. Critics of the study’s conclusions say its parameters for evaluating the environmental impact of fake trees were too narrow, without enough consideration for the preservation of wildlife, habitat and farmland. “You maintain your landscape, and you remove the product to maintain the viewscape,” Maxwell McCormack, professor emeritus at the University of Maine School of Forest Resources, said. McCormack explained that Christmas tree farms also promote soil health and provide habitat for nesting birds. “There are other things going on out here that people don’t realize,” he added. Though Harman insists the average person will pass their old artificial tree on to someone else when they get a new one, natural tree advocates also point out the issue of waste from disposed artificial trees.